Dienekes’ Anthropology Blog: Eureka! 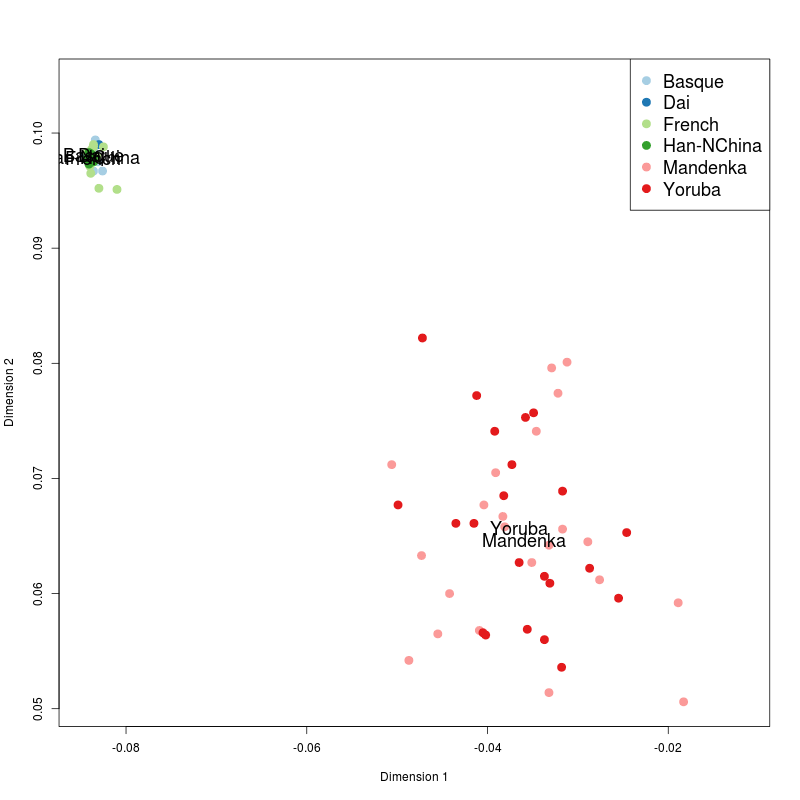 African population structure contributing to signal of "Neandertal admixture"
Eureka! 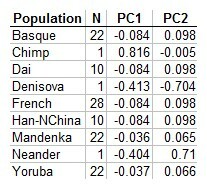 African population structure contributing to signal of "Neandertal admixture"
Just as I was finishing my recent post arguing for a serious consideration of the African structure hypothesis, a much better way of proving it beyond a reasonable doubt occurred to me. Ancestral modern humans possessed both alleles, but one of them was lost in the Out-of-Africa bottleneck. Ancestral modern humans possessed only one of the two alleles, and the second one appeared by mutation in Africans after the Out-of-Africa event. Ancestral modern humans possessed only one of the two alleles, and the second one appeared by introgression, from a second African population, after the Out-of-Africa event. The first two cases are "pure Out-of-Africa" with no archaic introgression whatsoever. 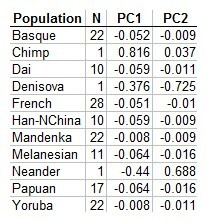 In such SNPs, humans are expected to be equally related to any archaic hominin. 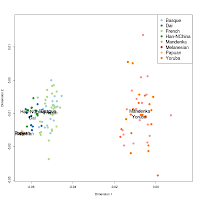 The third case involves a structured population: one sub-population ("Afrasians") is monomorphic and spawns Eurasians, while another ("Palaeoafricans") possesses the second allele. When population structure breaks down, "Afrasians" and "Palaeoafricans" mix, but the Out-of-Africa event has already happened, so Eurasians, descended exclusively from "Afrasians" do not have the opportunity to possess the second allele. 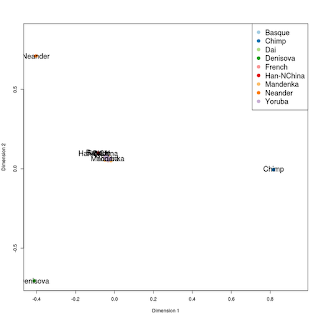 Africans, on the other hand, end up with both alleles at the SNP. 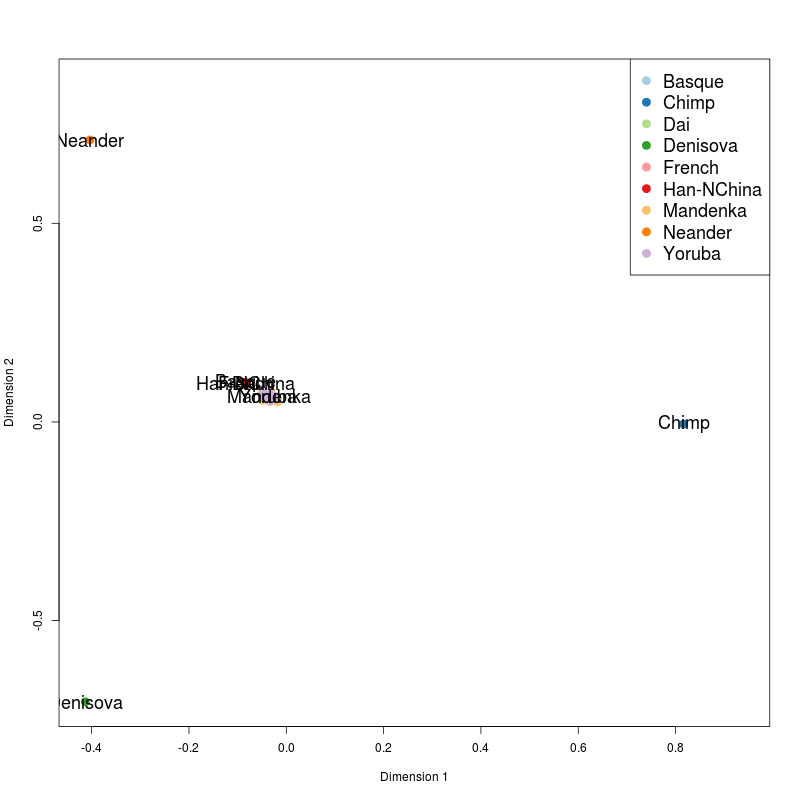 So, let's see how the PCA looks like when we consider such SNPs, which constitute ~14% of panel 4. It is clear that the signal of differential Neandertal affinity is preserved for this class of SNPs. 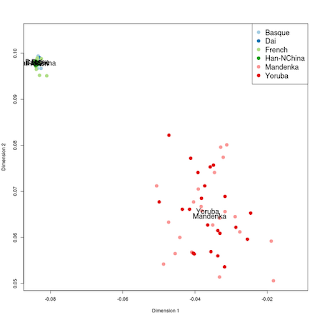 Eurasians are about 5.1% shifted towards Neandertals along the Neandertal-Yoruba axis, which is much stronger than in any of the experiments of the previous post. The only reasonable explanation for this pattern is African population structure. 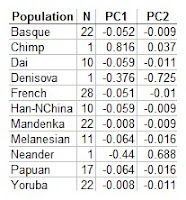 It is clear that modern Eurasians deviate towards archaic Eurasians for this class of SNPs that are monomorphic in Papuans/Melanesians and polymorphic in Africans, which is again consistent only with a structured ancestral African population. how does this explain denisova shift amongst melanesians? Just saw that my post above was a little confusing. I was inspired by Dienekes's Eureka, mixed two schemata I had sketched and didn't proofread, but I think you get the picture. As for those who still wonder "but why should admixture have been a bigger issue in Africa? ", not sure (pop. density?). But, the evidence is there: unlike Eurasia, Africa has the "smoking gun" - VERY deep clades that undoubtedly predate the UP revolution and seem to stand apart from everyone else. Could selection also be a plausible explanation? consider the mutation which causes sickle_cell anemia. Selection pressure from malaria keeps it present in Africa while it's deleterious effects eliminate it from populations with no threat from malaria. Another approach I have suggested before is to only take into consideration Neanderthal mutations (different from chimps) that are the same in Denisovans (we don't need to worry about Denisovan admixture in most of the Eurasian population). 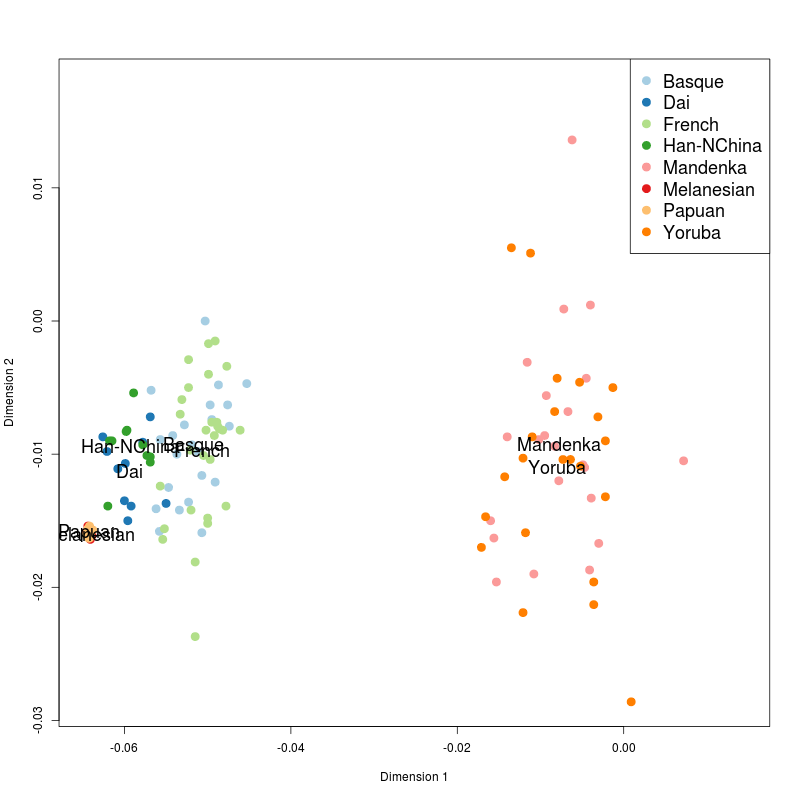 Such a D-statistic would rather mostly exclude the African admixture contribution, if any.